Sepcon Systems provides engineered solutions to tackle water and sewage treatment needs at municipal level. We deliver EPC projects with sound engineering and diligent execution. While we provide various technologies and processes for treatment, our ability to adapt and work with the right choice for your need is critical towards optimising project cost and other resources which also benefits the target community. 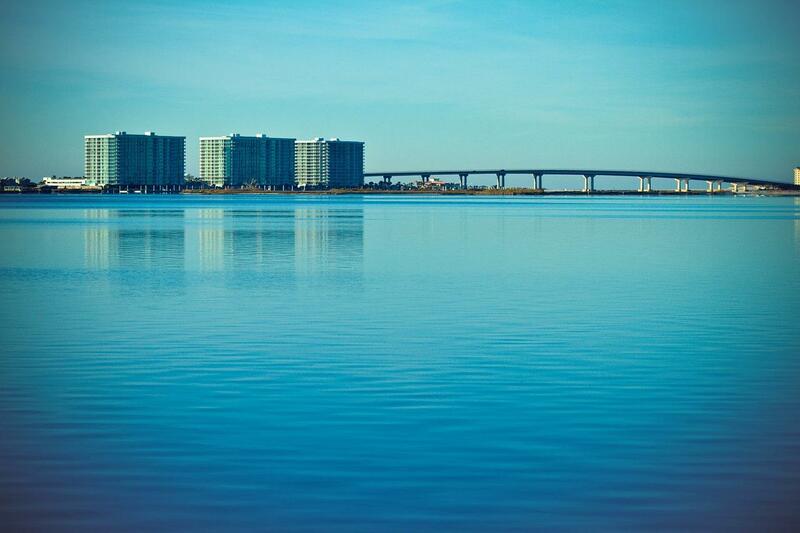 Our innovative multi-disciplinary team while partnering with the best vendor partners will provide you the confidence in meeting the required water quality standards on a continuous basis. The following are the combinations of the processes for water and wastewater treatment with various systems and products that we offer. Click on each element to know more and for futher details, contact us and we would be glad to work out the right solution for your needs. Raw Water Intake Sepcon Systems provides screens that are designed to meet challenges of suitable municipal as well as industrial intake water. Fish Guidance System Fish guidance systems reduce the amount of fish caught in water intakes, improving plant efficiency and minimizing the environmental impact of treatment plants. Mixing / Floccutlation Coagulation/Flocculation is the process of creating conditions for particulates to come together to form flocs of solids and then settle below treated water. Clarification / Sedimentation Sedimentation is the mainstay process for liquid-solid separation. Our innovative designs perform consistently and reliably, in any given application. Clarifier Clarification involes sedimentation which has been the mainstay process for solid-liquid separation in the wastewater industry. Inclined Plate Separator Inclined plate settlers are clarification accessories that use lamella plate units to increase the capacity of conventional clarifiers in a more compact footprint. Filtration Filtration is a mechanical process that separates solids from liquid. Numerous methods can be relied upon, depending on the application and the particles size. 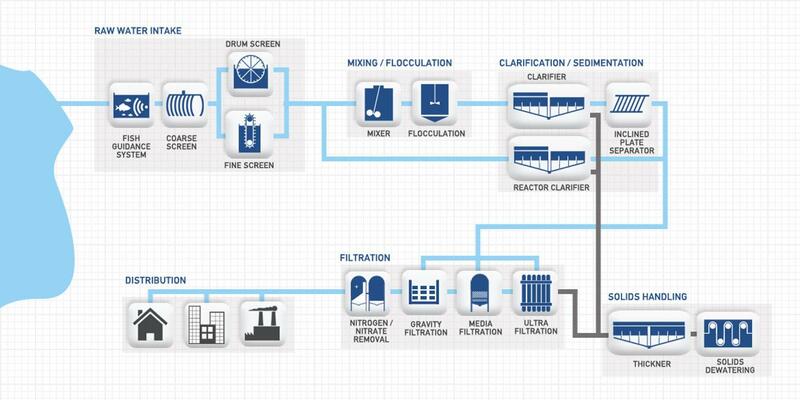 Ultra Filtration Filtration is a mechanical process that separates solids from liquid. Ultra Filtration implements suitable membrane separation technology depending on the application and the particle sizes. Gravity Filtration Gravity filtration is a physical process for the separation of solids from liquids. It separates particles in the feed from the resulting filtrate. Nitrate Removal Sepcon Systems offers ion-exchange nitrate removal solutions for the potable water industry which are highly efficient, high rate and generate low waste. Solids Handling The associated costs of solids' disposal significantly effect the operating costs of Municipal drinking water treatment plants. We implement energy effecient units to reduce operational costs. Solids Dewatering During production of drinking water a solid-liquid mixture containing very high water content is generated which are separated using mechanical equipments. Distribution The treated water is as per potable water standards and the distribution is carried out by the respective authorities throught various channels. Networks Sepcon Systems undertakes EPC contracting incorporating careful design considerations along the length of a sewerage network. Headworks In Municipal wastewater treatment plants, most equipment downtime is due to material not being removed at the initial stages of treatment. Screening Handling Removal Screenings removal systems wash and compact material, producing virtually odor-free solids for storage, transport and disposal. Inlet Screen The initial stage of raw water and wastewater treatment is the removal of solids. Sepcon Systems offers a variety of inlet screens based on application. Grit Classifier Grit classifiers are packaged systems used for the separation of mineral grit from water and other solids discharged. IFAS Integrated fixed-film activated sludge (IFAS) systems consist of a submerged, fixed-bed media, which promotes attached growth biomass for wastewater treatment. RBC Rotating Biological Contactors (RBC) remove soluable & biodegradable organic material from domestic and industrial wastewater. SAF Submerged Aerated Filters (SAF) are small footprint, biological wastewater treatment units that are easy to install and operate. Wastewater Reuse / Tertiary Filtration Minimizing absolute consumption and maximizing the treated return, from available source is fundamental to our ecological balance. Reverse Osmosis This membrane filtration process eliminated dissolved pollutants inclusing baterial matter. This aids in producing highly clean water that re-usable. Sludge Handling The associated costs of sludge disposal significantly effect the economics of wastewater treatment plants, hence there is a need to implement energy and process effecient systems. Membrane Thickener Membrane thickeners utilize membranes to thicken solids without the use of chemicals, resulting in lower operating costs and a smaller carbon footprint. 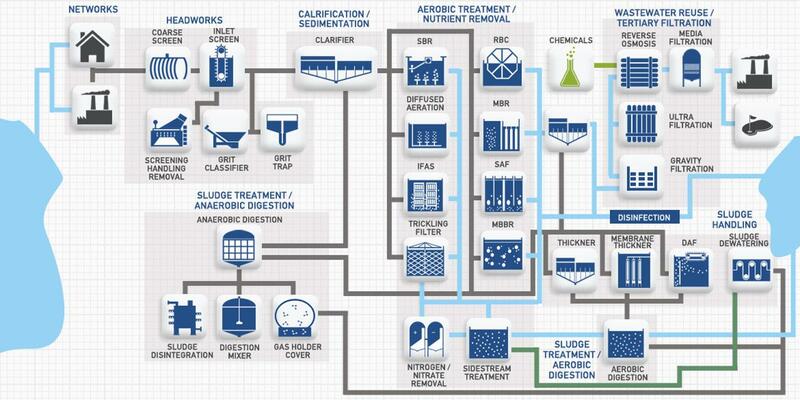 Sludge Treatment / Aerobic Digestion The associated costs of sludge disposal significantly effect the economics of wastewater treatment plants and energy efficitent processes of different technologies are available. Nitrate Removal We offer ion-exchange nitrate removal solutions which are highly efficient, high rate and generate low waste. Sludge Treatment/Anaerobic Digestion Anaerobic digestion is a biological treatment occuring in the absence of air or elemental oxygen. Organic pollutants are converted by micro-organisms into gas which can be reused for generating power. Sludge Disintegrator Sludge disintegration is one of the several technologies and innovations that have made their entry recently to favor sludge reduction. Digestion Mixer Anaerobic digestion is highly dependent upon effective sludge mixing which is carried out in the digestion mixer. Gas Holder Cover Steel digester covers and membrane gas holders are key components of an anaeraobic digestion solution, when recovery of biogas is important for productive applications.